Me and my dad look so alike we won the look alike contest at the Amwell St summer fete. Think our prize might have been a bit tastier though. Is that your dog? Do you lokk like that?! Oh, I love him! (or her ;) ). Beautiful dog! What's his name? What a looker! Is it called “Winston”? What a dog! 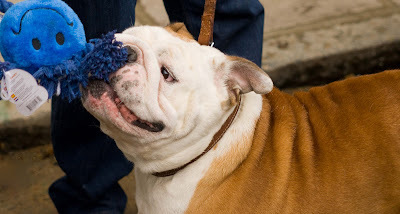 Bulldogs are such great dogs - the most fabulous temperament. Love this dog. Now what do you look like, Mo?! aw...I love the little spots on his muzzle.